We do not need another “Bloody Sunday” inquiry that will take years and cost millions, Lord Saville spent twelve years and over £200 million to accomplish nothing. The phone hacking scandal, which may be just the tip of the iceberg in terms of lawbreaking and misconduct by the media, requires new laws to be introduced at the earliest opportunity. At the very least we want tough new guidelines and sharper teeth for the complaints handling process immediately. We are not going to get satisfaction from a ponderous inquiry. We want action. If Lord Leveson cannot undertake to complete his inquiry within three months, he should step down now. We should instead put it out to tender. We should invite commercial bids to conduct the inquiry from suitable organisations. Interested parties submit sealed bids outlining their capabilities and setting out how they would conduct the inquiry. The government then appoints the most competent and cost-effective contractor to do the job. And of course, there must be a penalty clause for late delivery. Should Lord Leveson get to drag his inquiry out as he plans, time will have moved on, dirt will have been brushed under carpets, excuses will be fine tuned, and we’ll all forget why this is such an important issue. The guilty will escape jail, they’ll carry on making money and eventually retire in ill-deserved comfort. And after a suitable interval we can be sure everyone will be back up to their old tricks again, write best-selling memoirs telling all and have the last laugh at our expense. And there will have been no justice done. It had to happen. It’s been years since we had a shooting outrage, but within minutes of the latest one, and on the basis of no knowledge whatsoever, we have the first knee-jerk reactions calling for tighter gun control. First of all it has been reported that this guy held his license for 15 years. Is there any possibility whatsoever we could make gun license applicants wait fifteen years to see if they were going to do anything stupid? On top of all the other existing conditions and restrictions? Would that work? Of course not. In the 15 years he held his license, some 750 people (as near as I can find out right now) have been shot dead by people not licensed to carry guns. It is suggested that he “snapped”, perhaps provoked in a family dispute. It has also been reported he told a taxi driver he’d argued with the night before, “There’s going to be a rampage tomorrow,” and then he went home and armed himself with two weapons. He was dissuaded on that occasion by a friend’s daughter. I feel desperately sorry for her right now, how must she feel? But at that point, even then could he have been stopped? How many people get angry but never follow through? Could she have reported him? What if it turned out he was only making an idle threat? It must happen a million times. How about the hospital where he is supposed to have gone for help, only to be turned away? In the event, after killing his twin brother, he calmly went to the home of the family solicitor, waited for him and killed him, before going to Whitehaven to settle a grudge with former co-drivers. That done, and all in cold blood, he went off on his killing spree. It doesn’t seem to me he “snapped”, he made a calculated decision and followed it through. Even the killing of his brother could not have been a “snap” decision, it occurred at a quarry and not at the home of either of them. So they met there, and Bird took his guns with him. How do we legislate against that, other than “No guns, no way”? I think everyone who’s asking that question right now is asking the wrong question. I would be much more interested in a debate about personal responsibility. He was able to rationalise his actions before he took them. How did he get there? I think that’s the more frightening aspect. I was rather taken aback when I went to the Telegraph web site recently to read up on a topic I was interested in. I found three or four reports on what I was looking for, but they were all videos. Aside from one photo in a paragraph that linked into these stories, there were no other photos, and aside from the introductory text on the same paragraph, there was no other text. I would have expected this on the BBC web site, after all they are a television broadcaster, but the Telegraph exists in the world of the printed word. Writing imposes certain disciplines, it trains the mind to think and construct arguments, to make points, to reason. Writing also works because it has to be read, and you have to think to read. With words, you can re-read a sentence and ponder any deeper meaning. Writing can be Googled, linked and quoted. The written word, therefore, helps us to tease out knowledge and improve our understanding because it makes the writer think about what he’s writing, and gives the reader time to think and digest that meaning. Video is an entirely different medium. That’s not to say that a well-written and well delivered piece to camera cannot have any impact, on the contrary, it can have massive impact which can be multiplied when transcribed and made available to a wider audience. But it’s impossible for a commentator to alter a single word or phrase without having to re-record the whole segment, it’s tedious for the viewer to rewind and play a clip repeatedly to review a comment, and all too easy to “space out” and miss a crucial point. But my greatest disappointment is for what this video-only trend means to the art of photography. It is of course a tired cliche to say that a picture is worth a thousand words, but I really believe that, even in this photoshopped era. However, it does not follow that video at 30 frames per second is worth thirty thousand words per second. A short video clip may indeed be worth less than an excellent photograph because in my view, the skilled photographer can capture a moment in time which we can then study at length. News media are struggling to maintain full complements of journalists as it is, but if they also need more cameramen to record video then traditional stills photography will be sacrificed. I don’t think a frame-grab from video is the same thing. So I see fewer photographers out there in future and the diminishing of a remarkable medium for documenting social and political history. 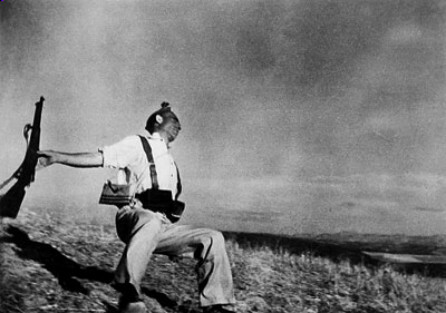 Would Robert Capa’s “Death of a Loyalist Soldier” have resonated down the ages if it had been a clip on YouTube? I don’t think so. This is really sad news. Reader’s Digest in the UK has gone into administration. I remember as a child in Singapore many years ago that, despite being surrounded by learning at an outstanding boarding school, in particular spending hours in a well stocked library, Reader’s Digest was my most valued source of knowledge and the real agent for the broadening of my outlook on life. The magazine had a wide and eclectic range of essays, all well written in an accessible, informative style. I enjoyed the mix of jokes and real life anecdotes, even the adverts seemed to impart knowledge. But I especially treasured William Funk’s word quiz in particular. So valuable was this magazine to me that I would use some of my modest allowance to buy a copy and devour it, every page, cover to cover. It was in Reader’s Digest that I read about the life of President Kennedy; of the dangers of smoking (even then! ): and of real life struggles against adversity by many extraordinary yet ordinary people. 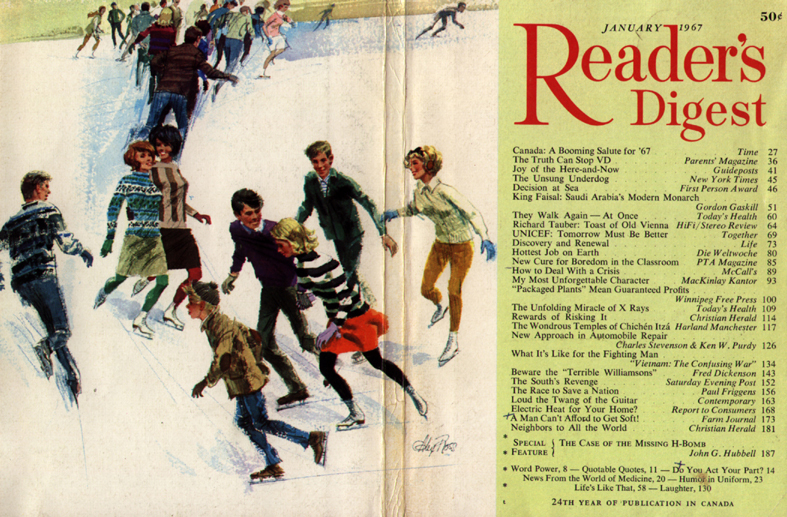 In some respects, Reader’s Digest was a forerunner of Dorling Kindersley’s books in the way they explained and illustrated their stories. I didn’t get the same buzz again until many years later when I bought a set of Encyclopedia Britannica. I tried a subscription to it here in the UK a couple of years ago, but I think really our 24 hour news culture and the Internet had killed it off. Practically everything I read in it I had already read about somewhere else. We have an incredibly wide source of knowledge and information today. My main sources are the Viigo rss feed on my BlackBerry, and through it Huffington Post, the New York Times, the Daily Telegraph, Slashdot and Techcrunch. I also use Google and Wikipedia a lot, and for a good handle on what passes for the current conversation, Facebook and Twitter. Given all that, it’s hard to see how there could be a role for Reader’s Digest in any format. But I still have a great sense of loss.